I love cooking with beer! 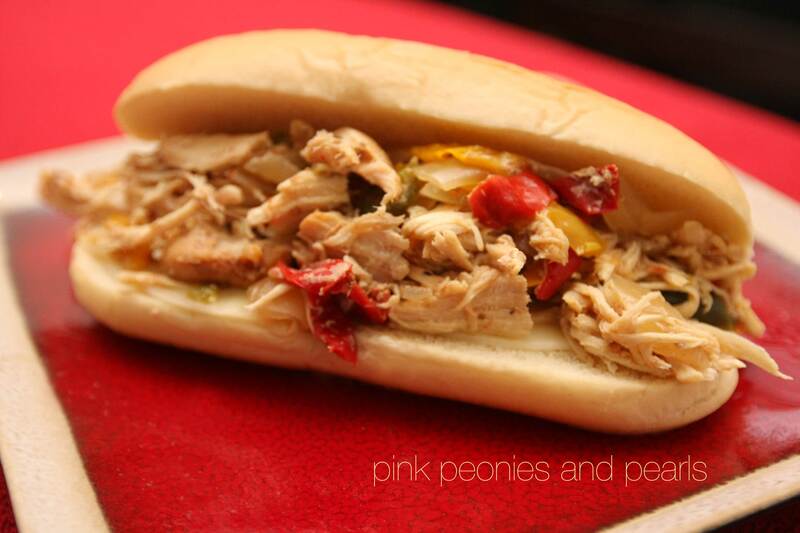 When I found this chicken cheesesteak recipe on the blog over at Sally Cooks, I had to try it out! Mr. Cooper and I hate to be in a cooking rut. These hearty sandwiches were a hit. Thanks so much, Sally! On the bottom of the crockpot, add a layer onion, green, red, yellow and jalapeño peppers. I used the frozen ones I already chopped (fresh from the farmer’s market). Mince four garlic cloves. Add to the pot. Add two large chicken breasts. It is okay if they are frozen, too. Sprinkle the chicken with a 1/2 tsp. garlic powder, 1/2 tsp. chili powder, 1/2 tsp. salt, and 1/2 tsp. pepper. Pour a bottle of your favorite beer on top of the chicken. I used a 12 ounce bottle of Bud Light. It was the perfect amount. Cover and cook. I cooked this for 4 hours on HIGH. Sally suggests you cook it 6-8 hours on LOW. It will taste amazing either way. I didn’t have six hours before my hubby came home. Once it is done cooking, use a fork and shred the chicken. The meat falls apart. You can serve this with or without buns. I put two slices of ultra thin provolone cheese on a deli bun and topped it with chicken cheesesteak. Enjoy! This sandwich will warm you up! There was enough left over for his lunch tomorrow! This one is on my economic edibles list!